Will Paul have a winner at Brighton (above) today? Watt Broderick remains capable of better and this doesn’t look like taking much winning. 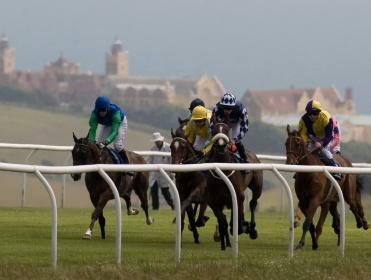 More quantity than quality this afternoon but Watt Broderick looks to have a cracking chance in the 16:15 at Brighton. He hasn't taken long to find his feet for his current stable, landing strong support at Yarmouth in June. He pulled clear with Speedi Mouse there and that one has since gone on to win three times. Sent off favourite at Pontefract last time, he couldn't peg back the enterprisingly ridden Alkadi but that form was made to look better when third-placed Miss Ellany went in at the weekend. A small rise in the weights followed but Watt Broderick remains capable of better and this doesn't look like taking much winning. The absence of Cape Savannah in the 15:05 at Yarmouth should leave the way open for Three Bards to lead at his pleasure and he will be hard to peg back if given that luxury. Progressive this summer, he found some smart opposition too hot to handle at Haydock last time but this looks less competitive and he can go very well this field.